Every leak detection investigation that we undertake uses the most state-of-the-art leak detection equipment. This allows our engineers to work in a very cost efficient and time friendly way. For our customers it means we can find the source of any interior or exterior leak on your property and offer you very competitive pricing while we’re doing that. Regardless of where you live in the United Kingdom though ADI gas leak detection can help you find your leak. 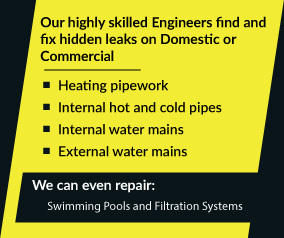 ADI are only a phone call away and your leak problem is something we can definitely help with. Call us now on 08007313843.